Remember when stores used to be attractive and pleasant places to go, with excess inventory usually safely stocked “out back,” where boxes of merchandise couldn’t fall on unsuspecting customers? Times have changed, haven’t they? As anyone who has ever been in a big-box store in the past 20 years or so is aware, most of these stores now are stocked full of merchandise in open view, almost from the floor to their very high ceilings. 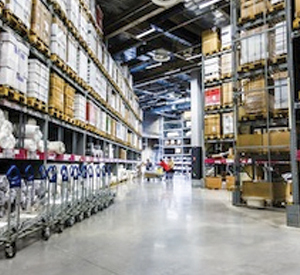 Retail warehouse businesses that fall into the big-box category include Lowe's, Home Depot, Kmart, Toys 'R' Us, PetSmart, Costco, Sam's Club, and Staples. The retail warehouse business, which exploded during the 1990s, shows no signs of slowing down. These stores operate on the premise that it is more efficient, less costly and more profitable to warehouse as much merchandise as possible right in the store itself, rather than in backroom storage areas or off-site warehouses. Large amounts of merchandise like this are not stored horizontally, but stacked vertically – and that invites trouble in the form of falling merchandise. Over the past 10 years, it is estimated that thousands of people have been injured, and some even killed, by store merchandise and inventory that has fallen onto unsuspecting shoppers in big-box stores. Hot water heaters, doors, TVs, pet supplies, toys, you name it – can fall off high shelves and cause injuries to customers at a rate that most people would be surprised by. These events are usually quite serious, commonly involving injuries to the head, back injuries, and broken bones. Sometimes, these accidents can even be fatal, leading to a Massachusetts wrongful death lawsuit. If you or someone you know has been injured in a Massachusetts store by falling merchandise, you may be entitled to substantial compensation, and should consult with a Boston, Massachusetts falling merchandise attorney to help you recover legally and financially from your injuries. Our firm has expert attorneys in this area of law, and we can provide you the answers and guidance that you need right now. Call us at (781) 320-0062 or (617) 285-3600 or email us confidentially. We offer all of our potential legal clients a FREE INITIAL CONSULTATION of up to 30 minutes and will respond promptly to your call or email about your injury. We litigate these cases on a contingent fee basis. This means that you WILL NOT HAVE TO PAY US ANY LEGAL FEES UNLESS WE WIN YOUR CASE FOR YOU. What Types of Store Practices Increase the Risk of Falling Merchandise Accidents? Merchandise is frequently stacked on shelves that can reach up to 15 feet above the sales floor. Stacking merchandise this high creates unstable conditions with boxes and merchandise. It is not uncommon that customers much stretch, use a ladder, or climb on shelves in order to retrieve merchandise. This is a prescription for disaster. Merchants, who are well-aware of the risks involved in stacking merchandise this way, sometimes do not warn customers of these risks with warning signs; sometimes they do not cordon off shopping aisles when merchandise is being stocked or removed; and sometimes they do not use spotters when product stocking is taking place. Merchants often don’t employ physical-restraining safety devices such as security bars, fencing, safety ties, and shelf extenders on a store’s high shelves. Inadequate Employee Training and Supervision. Many times, merchandise falls off shelving because items and boxes of different sizes are negligently stacked on top of each other, due to store employees being inadequately trained in safe product stocking techniques. Falling merchandise can frequently tip over or become unstable when someone moves merchandise on a shelf in the adjoining aisle or in an immediately adjoining area that has been stacked in an unstable manner. The act of moving merchandise on one shelf can cause merchandise to fall from an adjacent shelf. At other times, simple vibrations can dislodge an item and cause it to plummet downward. Too many store managers know about the risk of falling merchandise but do not take appropriate action to reduce this injury risk or to provide a safe environment for their customers. Why? The reasons are usually a combination of increased cost and decreased attention. As Boston, Massachusetts personal injury attorneys, we’ve seen this business game played a thousand times before: Cut costs and corners at the expense of customer safety. For anyone who has been injured in an accident in Massachusetts, it’s hard to know exactly what to do in the immediate aftermath of such an event. To learn some valuable tips about what to do – and not to do – following an injury due to someone else’s negligence in Massachusetts, click here to receive our FREE article, “The Top 10 Things To Do After Suffering An Accident Or Injury In Massachusetts.” This feature article contains important information for big-box store injury victims, discussing the immediate steps you should take after suffering an injury such as in a falling merchandise accident. You’ll learn how to best protect yourself following such an incident. We have worked with thousands of personal injury victims, and are experienced in the best legal strategies required to recover the financial damages that injury victims deserve. Read about our legal successes by clicking here. Who is Liable for Massachusetts Falling Merchandise Injuries? Whether a big-box store or otherwise, a commercial business can’t legally just throw open its doors to customers, without taking certain measures to assure the safety of those customers. The law imposes a legal duty on a store or any business establishment to take steps to assure that the premises are safe for its customers and visitors (legally known as “business invitees.”) This duty is imposed under a body of law known as Massachusetts premises liability. Store owners are legally obligated to make sure that their properties are reasonably safe from what are called premises hazards. Premises hazards can be any conditions that create an unreasonable risk of injury to customers or visitors. The owner or operator of the property is required to inspect the premises on a regular basis for dangers and risks posed to the general public, and it is required to correct those risks. Shelves need to be checked periodically to discover whether merchandise has been stored in a safe position by employees. When a store fails to meet the legal duty owed to its customers and invitees, the store can be held liable for any injuries that result from the breach of that duty. This translates into paying for all costs that the injured person has incurred as a result of the injury. These costs include medical and hospital bills, lost wages, physical rehabilitation and pain and suffering, as well as other damages. How do I Know If I Have a Valid Massachusetts Injury Claim for Falling Merchandise? If either you or someone you care about has been injured in a store by falling merchandise, it is very important that you get prompt legal advice to learn whether you can recover what may be substantial damages for your injuries. Very importantly: Anyone injured in such an accident needs to act quickly in contacting an experienced Boston, Massachusetts falling merchandise injury law firm, because evidence at the store needs to be investigated and preserved very quickly. You can expect that the store will try to “cover its tracks” very quickly, in terms of denying liability. At the Law Offices of William D. Kickham, our Boston personal injury attorneys know precisely how to legally assess what has occurred in order to advise you whether or not you have a valid case. If the facts of the accident support a valid claim, we know how to get you the compensation that you deserve, and our case successes demonstrate this. Call us at (781) 320-0062 or (617) 285-3600 or click here to send us a confidential email. We offer all of our potential legal clients a FREE INITIAL CONSULTATION of up to 30 minutes and will respond promptly to your call or email about your injury. YOU WILL OWE US NO LEGAL FEES UNLESS WE WIN YOUR CASE AND RECOVER FINANCIAL COMPENSATION FOR YOU. If necessary, we can travel to your home or hospital if you are too injured to meet at our offices in Westwood and Boston. If you recognize Attorney Kickham’s name, it’s because Boston, Massachusetts injury lawyer William D. Kickham is an experienced legal analyst for a prestigious media, including Court TV (now In Session on HLN,) Fox News TV-25/Boston, The Boston Herald, WBZ-AM Radio 1030, WCVB-TV5/Boston, Nightside With Dan Rea, Greater Boston With Emily Rooney, Money Matters Radio/Boston, and The Metro Newspaper/Boston. Put that expertise to work for you. You’ll be thankful that you did.